Jump into salvation while you are alive. What you call "salvation" belongs to the time before death. To be enlightened is to be intimate with all things. God whose love and joy are everywhere can't come to visit unless you aren't there. 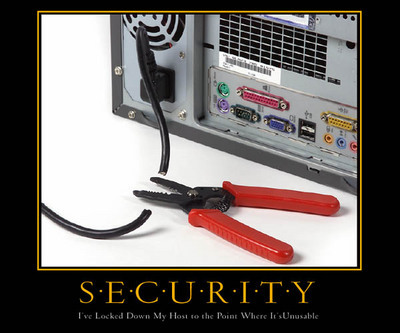 The image accompanying is from a 2004 calendar entitled A Year Of Agony, which was put out by Sourcefire, a network security company. [link] The caption reads "I've locked down my host to the point where it's unusable." Our computer is the same one we had in 2004 (we're window-shopping eagerly for a new one) but in the meantime has developed so many knots in its processing that I feel we're losing this war almost as badly as the invasion of Iraq. For indeed what other appliance do you buy for your household that comes under actual attack from parties known and unknown the moment you connect it up to use? Say what you will about the malicious geeks out there, they're brought planned obsolescence to an art form. Of course neocons preach the consumer needs no help battling this army all by yourself in your tilty deskchair. I spend at least a half hour a day doing routine maintenance on this thing. We have dialup but I can't blame all the weirdness in the machine on that. I've been struggling for 2 months to get my Norton scan to work properly again. I suspect a Microsoft Priority Update as the culprit...but maybe it's an undetectable worm picked up at MySpace. I seem to be spending more time worrying about what's infecting our computer than my own bodily health! But like that organism, it seems the more I try to do about it, the worse everything gets. Thus the illustration here. piece of cake, but time consuming, to stay abreast of all that 'could' go wrong, and does. Online attacks, spam, and sneaky cybercrime top list of year's most common security issues. Hackers teamed with professional criminal gangs in increasingly sophisticated computer crime operations aimed purely for profit. In May, 20,000 phishing complaints were reported, a 34 percent increase over the previous year, according to U.S. Department of Justice report. The U.S. hosts the largest percentage of phishing sites, it said. But law enforcement agencies are getting more organized and cooperating better, particularly in international investigations. At least 45 countries participate in the G8 24/7 High Tech Crime Network, which requires nations to have a contact available 24 hours a day to aid in quickly securing electronic evidence for trans-border cybercrime investigations. The private sector has also helped. Microsoft filed dozens of civil suits and gave information to law enforcement for criminal cases in Europe, the Middle East and the United States against alleged phishers throughout 2006. With automatic software updates now the norm, hackers have been forced to look a little harder for ways to put their malicious software on unsuspecting victims' PCs. In 2006 they turned to zero-day attacks as never before. This was followed, later in the year, by a rash of very targeted online attacks that exploited unpatched flaws in Microsoft's Office software. In fact, Microsoft warned of the latest such attack -- this one targeting a flaw in Word -- just this month. To underline the scope of the zero-day problem, security researchers launched widely publicized "Month of Kernel Bugs" and "Month of Browser Bugs" projects, during which they exposed a new, unpatched vulnerability in browsers and operating systems every day for a month. Microsoft's Chief Software Architect Bill Gates predicted two years ago that spam would be gone by 2006. He should check his in-box. Spammers also put messages in the images themselves, a tougher challenge to stop since it requires processor-intensive optical character recognition (OCR) techniques. Spam remained the delivery vehicle for other malicious software such as keystroke loggers and rootkits in addition to promoting links to phishing sites, which often aim to steal financial data or log-in credentials. MySpace.com may be a poster child for Web 2.0, but from a security perspective, it hasn't been looking so pretty. Security experts say that the kind of cross-site scripting attack used in the recent MySpace worm has become much more prevalent in the past year, as hackers have discovered just how much can be done with these attacks. These bugs can be used to do far more harm than many people realize, security experts say, including forcing PCs to download illegal content, hack other Web sites or send e-mail. Microsoft rankled security vendors by saying it wouldn't allow their software to access the kernel of the 64-bit version of Windows Vista. Patch Guard, Microsoft's kernel security technology, blocks access to prevent unauthorized modifications by malicious software. Vendors, led by Symantec and McAfee, argued they needed access to the kernel to detect malicious software such as rootkits, which burrow deep into the OS. After a flurry of public statements and pressure from the European Commission, Microsoft agreed to make APIs (application programming interfaces) available. The APIs will allow host intrusion prevention technologies used by vendors to function without hooking the kernel. But Microsoft said the APIs wouldn't be ready until the release of Service Pack 1 for Vista. lots of food for thought there but relatively outdated stuff. Maybe it isn't outdated for the regular enduser who doesn't know the deep web. The invisible or dark web. Who never studied with Fravia or who actually takes part in things like youtube...the typical end-user who believes and forgets. Forgets that the web, so called, was started, conceived of, by DARPA. People lose their tempers, "here" as elsewhere in life. At the New Civilization Network patience is a necessity...and eventually, if one is awaiting any of the developments advertised in that Log or whatever it is on the Member Page, one's patience, membership and even existence may appear irrelevant totally. Our booted friend was part of an invitation by the Webmaster to engage members in helping him to improve and revamp the site. There were others who offered too. They all abandoned membership here in frustration. Ming and Chip got in a disagreement over tech stuff one night...which of course can happen to anyone...both lost tempers and it became a fight. The hacking occurred after Chip was bounced...and what bothered me about the incident was no announcement was made that it had happened. No one would have known about the member's "disappearance" had he not written a couple of us to explain why he couldn't be around anymore---and why trying to work with Ming was an exercise in total futility. When questioned at his Log, Ming gave his side of it as the official verdict. I understand, despite all the "spiritual" trappings, NCN was intended as an entrepreneurial message board. These Logs and the Chats were an afterthought and have cost the Webmaster more time and trouble than ever they've been worth...to him anyway. Some of us now contribute money to him to keep the place going, but I have no doubt that wouldn't stop him from shitcanning the site if he didn't use the platform for continued free Google advertisement. The few members still lingering on probably use it for the same thing. I don't mind a simple financial arrangement in which I pay for someone's service...but I don't have to get spiritual about it. The "new civilization" has enough charlatans, thank you. The rest of the comment I agree with, and thanks for the tips. I can see what you see, and its true, I use NCN to show the world what I think about it, and frankly, because of it's google statice. I chat around all over the net. I don't know about the primary reasons chip was kicked, all I know is he tryed to hack. Anyway, the way I see it, the primary reason was not my bussiness, and as well, a personal disagreement between the two parties involved, should of never been told to the membership, it was a private disagreement. And someone chose, to disclose it, just to cause troubles, he could of kept quiet and done his thing someplace else or whatever place to stay in contact. Its a managment issue, not a member issue. He'd of not been kicked if he did'nt hack or violate the site in some way. If you don't feel any need for community bushman, then of course you remain among the most contented members of New Sieve Network. In my view, 2 people fighting on a playground or an Internet site is a community issue. If one of those people has the power to eradicate totally another's right to exist there and to do so without the respect of public announcement, it is a political issue of major proportions. I'm sorry you don't see that. That you think an issued report of such an execution is just somebody trying to "make trouble" is absolutely terrifying. Apparently others have felt pain for continuing to come to this site...and have left entirely. When NCN becomes a ghost town, it is a community tragedy. Now Scotty and Swan have given notice they're out of here too. Sorry buddy, but something is very wrong here. I do respect your views. Ya, the problem is everyone wants to be king of the world, and when they fail its because they can't make people do what they want or think what they want, and choose to be hurt. Everybody wants to rule the world, by Tears for fears. I never did want to ''rule'' the world. So the everybody there is just a tad presumtuous. Nevertheless if a man is paying for a service of some sort than it behooves the service provider to make sure that man/woman is happy with the service. I don't quite see NCN as a service, although it is, and there is not a lot of 'community' activity going on as I can't quite feel that NCN is a community even in a cyber-space sense. The closest I get to that feeling of community is when someone comes here for a visit or I go to some NCN members place for a visit. I've never wanted to rule anything either---at least not since 6th grade or something. I'm at my best when I'm fixing up the last details of the dinner party, at my worst when in charge of the prisoners. There has been community here though, Vax, in the past in this so-called "public" area...and somewhat in those Group things too. When that was the case, particularly given the international flavor---something I don't find elsewhere on the Internet---there were happy times of people dreaming and doing together. The frustrations, mostly of coming up against indifference (of other members and master), have driven active participants away. Maybe people do just come and go in this life...and the times are complicated...but I miss that interaction, as surface as it was. seeing the bickering was confusing and unhelpful, tending to restrict one own views regardless, in an imagined way. A car, I could almost keep on the road myself. But a computer forget it: it is a leap off a cliff into hopefully some deep water for me. I came here because the sign on the Google search for Celestine Prophecy brought up NCN as the official site for this? As a latecomer to the 10th and 11th books I recognised the systems to which these books referred as being the same as those wowed by me in flourishing architectural practices and the like - much lateral thinking. Whilst at NCN the concept and basis ties to CProph thinking, there is little practice shown. Maybe I just don't know how blokes talk together. And the only way to participate is on the assumption it is all bonafide. So now there are two levels of interpretation for me, one, one is never quite sure of! people surely can't put in so much time and effort without at least 75% real meaning somewhere, so it can't all be weird. Sometimes it is really handy being a girl, it helps to be completely in the dark, like football, and not have a clue what is going on or even care (they are in Iraq for Gods sake, and Afghanistan); at least every one else HERE is really clever and knows so much about this jumping off the cliff stuff, it is really just nice to hang out with them for a while and smile and be happy to amongst this jumping-off-the-cliff set testing the life rafts or logs we fling out now and then and shout hi to one another in between the bobbing waves. The phishing is the only thing to really get at me, I tried to send some funds to Webmaster, but it kept saying everything was wrong, much easier back at the cliff face! 13 Jan 2007 @ 14:43 by jazzolog : Why Do People Come Here? 2007-01-03: g_lualdi: I am a very spiritual person. I'm a devoted pagan my dream is to becaome a counsler and a high-priestess. I'm also interested in anything that can better myself or the world around me." OK, go to her Profile and you'll see she is one new member who actually logged in here a couple days ago and maybe looked around. (Many don't, which is a fact I find totally confounding.) Wouldn't it be cool to email her and find out what she thought...or does no one care? I'd love to chat up Celestine Prophecy with Nraye but I actually know nothing about it. She could look to see if there's a Group here interested...or start one herself. But generally it appears most people who hook on to the Network get disappointed and just move on. I find it a waste of this resource. got the message Jazzolog, and yes, Bushman, completely agree, CP is just plain common sense info, but the fact is that not everyone is aware of this "mechanism" which helps to get things done. The fact that it is in a book, so popular, with the professional types, who have since changed their modis operandi more in keeping with the aspirations and achievements talked about in the book, is extremely heart warming in our troubled times. It confirms that there are others out there singing from the same hymn sheet, and I for one now live with eyes open wide to try to find these other people on a daily basis. The book confirms that everything that happens means something either big or small and one can learn to react to these happenings or life and make them work. As for starting a group here, one has to have a project, and move it along the lines of CP, in CP ways, that would be doing a CP project. It is a method, written down, easily accessible, inspirational, and allows greater socialability and enjoyment of life. That's all. NCN structure does resemble a sort of CP foot print for achievement in all fields, this is what I find so fantastic and exciting. But the content sometimes falls, and there are not as many positive connections as one might perhaps hope for. For anyone interested I started, as usual at the end, and first read the 10th insight, I may have peaked at the 9th, which is really interesting about one;s forbears and what they tried to achieve and have we continued to complete their aspirations because otherwise we won't succeed in ours now. We have at least to identify them, become aware of them, work them through mentally, etc accept them, and this helps our own aims, clears the path so to speak. Correct me if I am wrong Bushman? More relevant here is the 10th Insight, which contains and refers to hundreds of model projects and situations moved along on CP principles. It also refers to the panoply of belief systems in the world, in small contextual ways, and it is American non denominational in itself. This to my thinking makes it much more inclusive by default, as its approach is literally from the world of Business and and Work Place, and rethinking and applying principles in a new, non patronising (NCN?) way. When others already recognise where one is coming from, things happen and life is not so difficult. The personal issues it may raise are not for public domain, but the work place, project area issues certainly are and that is the chief point, to my thinking. 9th-10th insights, I agree, for me anyway, looking into the distant past has cleared the so called path, things I would of stopped for, due to curiosity, are known to me now, so I don't waste the time on them. I think when people come here, they are already fairly open minded. Like you maybe, I enjoy prying open the eyes of the semi blind, NCN is just a base for me to point people to, who are starting to see and personaly ask me if there is a place to go and maybe learn more. I mean here in Sedona AZ we have real round table discusion groups who can meet in person weekly, and its really uncanny, that the local groups virtualy mimic NCN in structure. Healers, and readers, all here for your curiosity and enjoyment. Boarders on a circus. But for the awakend, it's old hat. This is a link to his cultish group community, partly based on CP, but is mostly based on the Urantia book. Yah, nice links thanks Bushman. A good reference point to indicate to others is surely more than "old hat", especially to our esteemed Jazzolog here. The books are well written. Maybe inspiration will arrive sometime on how to gainfully apply and utilise the philosophy on this sytem.